With only two weeks until St. Patrick's Day, the celebrations have already begun in New York City. This past weekend, parades were held in Queens. Manhattan hosts its Saturday the 17th and Brooklyn marches on the 18th. However, Willamena has been busy working on a tour of Irish bars in New York City to help you with your celebration, no matter when you choose to commemorate. In trying to put one together similar to her tour of Haunted New York, she is facing a few problems. First, knowing her love for the pint, she wants to also find places she can actually go inside. That will probably have to be a separate tour. 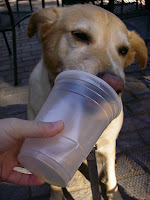 This is a picture of her this past summer licking off a beer at the SheepMeadow Cafe in Central Park on a break from her Haunted Tour. 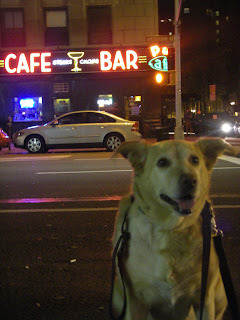 Also, she is finding several problems with taking pictures at night in front of bars. 1. Drunks. With the smoking ban they are outside smoking and ultimately want to take the picture of her or just entice her to lose her composure. Don't try to pet the beast when she is working. Or if she has a bone. Or if you are unruly or drunk or a child. You see the problems with this tour already. 2. The nightime lighting isn't as flattering to her features as time closer to magic hour. Hmmm, maybe we'll have to go with happy hour for this tour. No doubt the pictures will have to be retaken, regardless this one at the P&G Cafe on Amsterdam might not make the Irish Bar Tour. There are more than nine-thousand Irish bars in New York City to choose from and I'm not sure what P&G is other than a landmark from a Seinfeld episode. Yet another tour the beast will bring you soon. I think the lighting is very flattering to the beasts figure. Drunks ca be a pain, maybe happy hous is a good idea. Good to see the beast out and about. Is she 100% now? Yes, she is 100-percent! Thank you for asking. 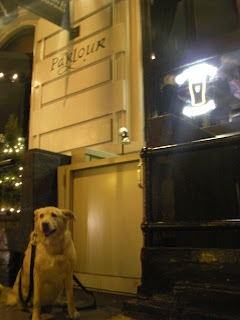 Just yesterday she made a two-and-a-half hour walk/tour of the upper east side taking pictures at Irish digs. They will be posted in the next day or so. Glad to here the beast is 100%.